The sky turns red/orange over the hills west of Fisherman Bay. 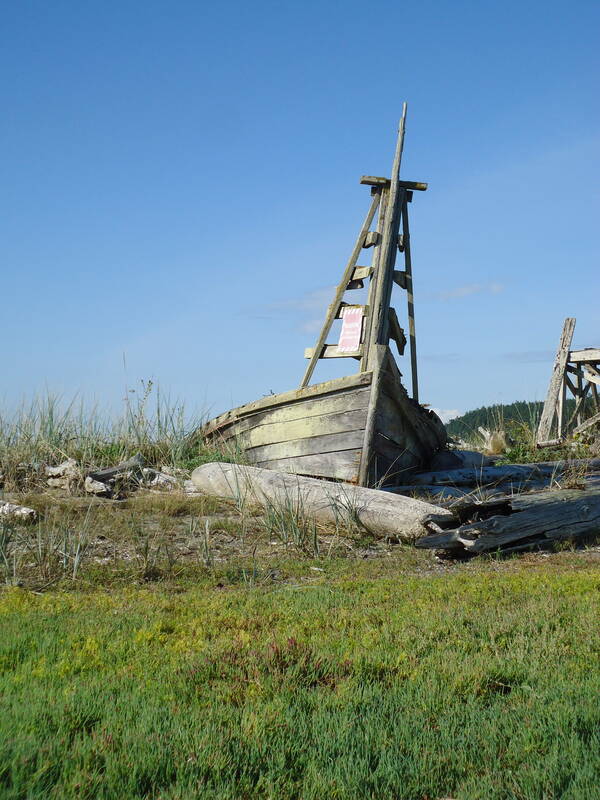 I row out to the narrow finger of rock that protects the entrance, to photograph the rough-hewn, skeletal remains of reef-net boats along the shore. They say Reef-netting is one of the oldest forms of fishing. In ancient times, fishing was continuous with the sacred traditional ceremonies. These ceremonies were held with elaborate theatrics. The simple act of fishing was performed with a cherished respect for salmon spirit that ensured their annual return. Everyday life was interwoven with the sacred like the twisted, cedar bark nets they so cunningly wrought and watched over through the centuries. A reef-netter still floats by the western shore, its tall, stark ladder inverted upon the surface of the bay. The water’s surface is the boundary, the imaginal space between worlds of height and depth. The sinuous patterns that shimmer over it’s surface are reflected in the curvilinear shapes of Salish art. It evokes the intermediate realm of dreams and myth; a place not found among the mystic way points of GPS. It is where the first salmon people hied up the narrow channels with the flood and into human consciousness. 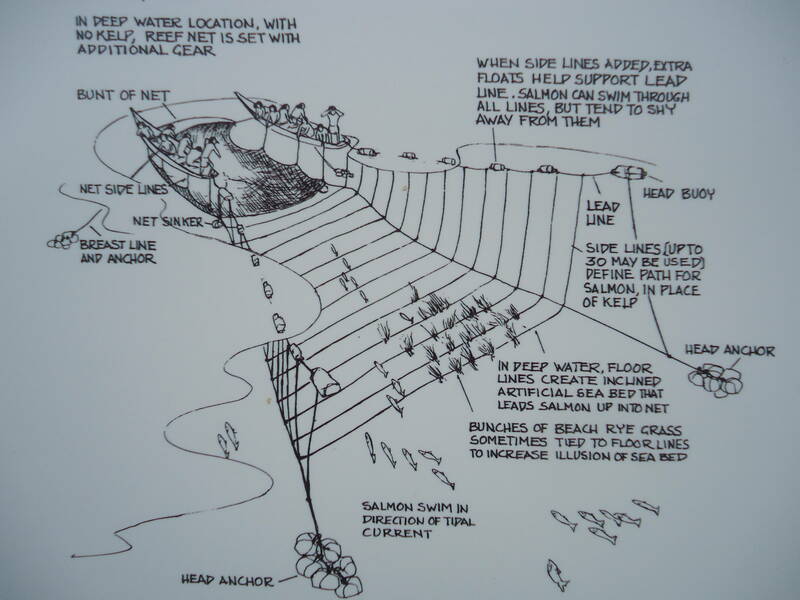 On reef-netters, the watcher (in earliest times, the tribal chief) would ascend the rough, cedar ladder high above the bow and intone the quiet prayer honoring the annual return of the salmon. While rowing in, I seem to hear an old diesel engine that drums faintly over the the inland sea like the rhythm of the universal heartbeat. Or is it the spirits of dead fishermen still drumming over the waters? These old songs are sung in another place than that found on the yellowed, dog-eared charts of linear time. The primordial drama is still re-enacted upon the weathered scaffold of artifice in the winter dancing houses of ancient memory.